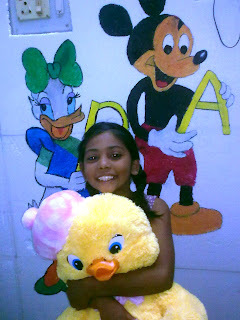 Children at St.Martha's, Bangalore receive toys from Toybank! Our Bangalore volunteers had met up on 26th Sept to wrap the toys donated by Walt Disney's 'Donate a Toy, Spread some Joy' campaign which happened in July. 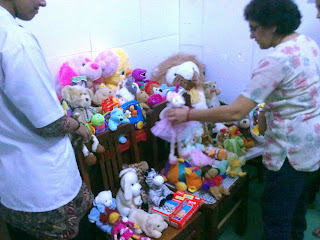 The toys were donated to 3 different organizations in and around Bangalore. 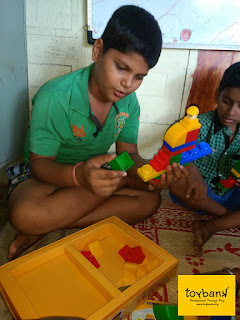 One of the recipients of these toys was St.Martha's Hospital, Bangalore.Toybank team is proud to have reached out to children at a Hospital for the first time in Bangalore. "Finally distributed the first batch of toys at the Pediatric ward at St.Martha's Hospital, Bangalore, last week. We didn't have a distribution event involving volunteers as originally planned; instead, the toys were handed over to the Sisters at the Pediatric ward, and they then quietly distributed them amongst the needy kids. One reason for this is that the Pediatric ward has kids from families of all economic backgrounds- some of the kids from well-to-do families there already hold toys with them- and these toys you've collected are for the ones whose parents cannot afford to buy them toys. An open distribution event where we pick only some of the kids in the room to hand toys to wouldn't have been the best idea, as you can imagine. Not all toys have been given yet, the Sisters'll be giving toys to other children as and when new admissions happen, that's the plan for now. 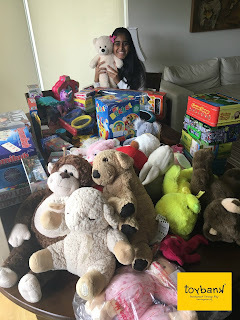 As far as feedback goes, I can tell you for a fact that we were all thrilled with the quality of the toys we got from Toybank- we imagine there are few things that can bring a smile and comfort to an ailing child the way a soft, huggable toy does; and the toys you gave us were definitely of a very huggable variety :)- mostly soft toys too, so that worked great! I wasn't present when the Sisters handed the toys over to the kids, so won't be able to tell you first hand about the kids' reaction (that would have been great, sorry about that), but the Sisters were very happy with the toys, I can tell you that- they were the ones who had initially expressed the need to bring cheer to the kids in the ward by getting them toys, so they're glad (and we are too!) that it's happened. And thanks too, for the overall experience of working with Toybank- really appreciate you putting together toys that fit the needs we had expressed, and also for keeping them all packed neatly and ready to pick up; made it easy for us, thanks :-)."